Go to your regional site? Would you like to visit your country specific website? Western blot analysis of extracts from various cell lines using DEK (E4S5J) Rabbit mAb (upper) and α-Actinin (D6F6) XP® Rabbit mAb #6487 (lower). As expected, DEK is not expressed when knocked out in 293T cells (293T DEK KO). Learn more about how we get our images. Immunohistochemical analysis of paraffin-embedded human colon carcinoma using DEK (E4S5J) Rabbit mAb. 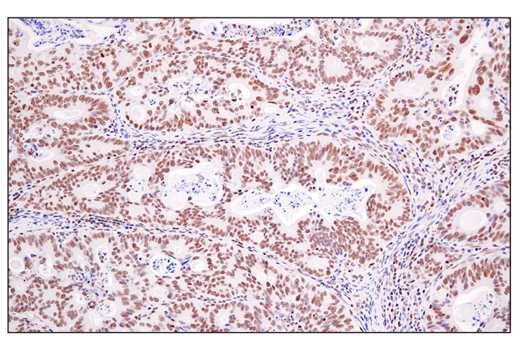 Immunohistochemical analysis of paraffin-embedded human colon carcinoma using DEK (E4S5J) Rabbit mAb (left) compared to concentration matched Rabbit (DA1E) mAb IgG XP® Isotype Control #3900 (right). 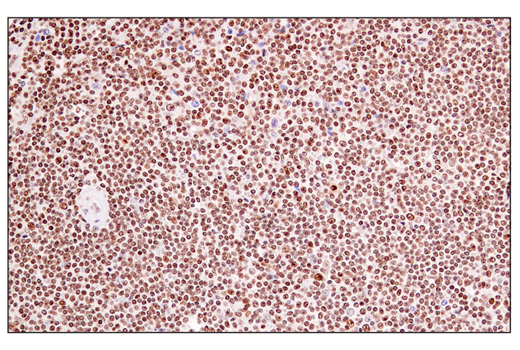 Immunohistochemical analysis of paraffin-embedded human non-Hodgkin's lymphoma using DEK (E4S5J) Rabbit mAb. 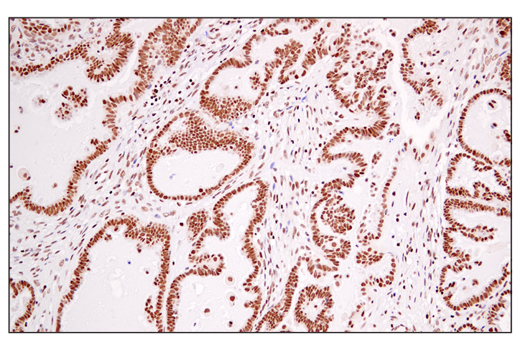 Immunohistochemical analysis of paraffin-embedded mouse prostate using DEK (E4S5J) Rabbit mAb. 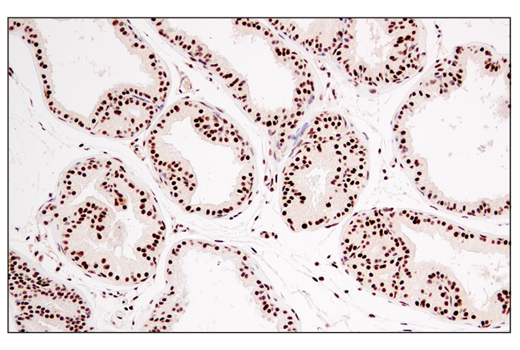 Immunohistochemical analysis of paraffin-embedded human ovarian serous carcinoma using DEK (E4S5J) Rabbit mAb. 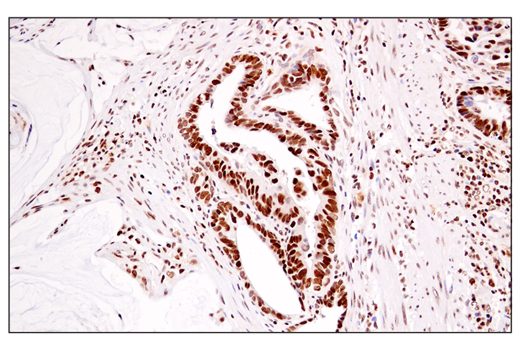 Immunohistochemical analysis of paraffin-embedded human gastric adenocarcinoma using DEK (E4S5J) Rabbit mAb. For western blots, incubate membrane with diluted primary antibody in 5% w/v nonfat dry milk, 1X TBS, 0.1% Tween® 20 at 4°C with gentle shaking, overnight. NOTE: Please refer to primary antibody datasheet or product webpage for recommended antibody dilution. NOTE: Prepare solutions with reverse osmosis deionized (RODI) or equivalent grade water. 20X Phosphate Buffered Saline (PBS): (#9808) To prepare 1 L 1X PBS: add 50 ml 20X PBS to 950 ml dH2O, mix. 10X Tris Buffered Saline (TBS): (#12498) To prepare 1 L 1X TBS: add 100 ml 10X to 900 ml dH2O, mix. 1X SDS Sample Buffer: Blue Loading Pack (#7722) or Red Loading Pack (#7723) Prepare fresh 3X reducing loading buffer by adding 1/10 volume 30X DTT to 1 volume of 3X SDS loading buffer. Dilute to 1X with dH2O. 10X Tris-Glycine SDS Running Buffer: (#4050) To prepare 1 L 1X running buffer: add 100 ml 10X running buffer to 900 ml dH2O, mix. 10X Tris-Glycine Transfer Buffer: (#12539) To prepare 1 L 1X Transfer Buffer: add 100 ml 10X Transfer Buffer to 200 ml methanol + 700 ml dH2O, mix. 10X Tris Buffered Saline with Tween® 20 (TBST): (#9997) To prepare 1 L 1X TBST: add 100 ml 10X TBST to 900 ml dH2O, mix. Blocking Buffer: 1X TBST with 5% w/v nonfat dry milk; for 150 ml, add 7.5 g nonfat dry milk to 150 ml 1X TBST and mix well. Wash Buffer: (#9997) 1X TBST. Primary Antibody Dilution Buffer: 1X TBST with 5% nonfat dry milk; for 20 ml, add 1.0 g nonfat dry milk to 20 ml 1X TBST and mix well. 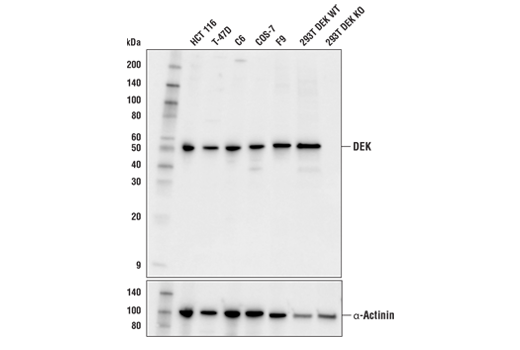 Biotinylated Protein Ladder Detection Pack: (#7727). Prestained Protein Marker, Broad Range (11-190 kDa): (#13953). Blotting Membrane and Paper: (#12369) This protocol has been optimized for nitrocellulose membranes. Pore size 0.2 µm is generally recommended. Secondary Antibody Conjugated to HRP: Anti-rabbit IgG, HRP-linked Antibody (#7074). Detection Reagent: SignalFire™ ECL Reagent (#6883). A general protocol for sample preparation. Treat cells by adding fresh media containing regulator for desired time. Aspirate media from cultures; wash cells with 1X PBS; aspirate. Lyse cells by adding 1X SDS sample buffer (100 µl per well of 6-well plate or 500 µl for a 10 cm diameter plate). Immediately scrape the cells off the plate and transfer the extract to a microcentrifuge tube. Keep on ice. Sonicate for 10–15 sec to complete cell lysis and shear DNA (to reduce sample viscosity). Heat a 20 µl sample to 95–100°C for 5 min; cool on ice. Load 20 µl onto SDS-PAGE gel (10 cm x 10 cm). NOTE: Loading of prestained molecular weight markers (#13953, 10 µl/lane) to verify electrotransfer and biotinylated protein ladder (#7727, 10 µl/lane) to determine molecular weights are recommended. Electrotransfer to nitrocellulose membrane (#12369). NOTE: Volumes are for 10 cm x 10 cm (100 cm2) of membrane; for different sized membranes, adjust volumes accordingly. (Optional) After transfer, wash nitrocellulose membrane with 25 ml TBS for 5 min at room temperature. Incubate membrane in 25 ml of blocking buffer for 1 hr at room temperature. Wash three times for 5 min each with 15 ml of TBST. Incubate membrane and primary antibody (at the appropriate dilution and diluent as recommended in the product datasheet) in 10 ml primary antibody dilution buffer with gentle agitation overnight at 4°C. Incubate membrane with Anti-rabbit IgG, HRP-linked Antibody (#7074 at 1:2000) and Anti-biotin, HRP-linked Antibody (#7075 at 1:1000–1:3000) to detect biotinylated protein markers in 10 ml of blocking buffer with gentle agitation for 1 hr at room temperature. Proceed with detection (Section D). Wash membrane-bound HRP (antibody conjugate) three times for 5 minutes in TBST. Prepare 1X SignalFire™ ECL Reagent (#6883)by diluting one part 2X Reagent A and one part 2X Reagent B (e.g. for 10 ml, add 5 ml Reagent A and 5 ml Reagent B). Mix well. Incubate substrate with membrane for 1 minute, remove excess solution (membrane remains wet), wrap in plastic and expose to X-ray film. * Avoid repeated exposure to skin. Reprobing of an existing membrane is a convenient means to immunoblot for multiple proteins independently when only a limited amount of sample is available. It should be noted that for the best possible results a fresh blot is always recommended. Reprobing can be a valuable method but with each reprobing of a blot there is potential for increased background signal. Additionally, it is recommended that you verify the removal of the first antibody complex prior to reprobing so that signal attributed to binding of the new antibody is not leftover signal from the first immunoblotting experiment. This can be done by re-exposing the blot to ECL reagents and making sure there is no signal prior to adding the next primary antibody. NOTE: Prepare solutions with reverse osmosis deionized (RODI) or equivalently purified water. Stripping Buffer: To prepare 100 ml, mix 6.25 ml of 1M Tris-HCl pH 6.8, 10 ml of 20% SDS and 700 μl β-mercaptoethanol. Bring to 100 ml with deionized H20. Make buffer fresh just prior to use. After film exposure, wash membrane four times for 5 min each in TBST. Best results are obtained if the membrane is not allowed to dry. Incubate membrane for 30 min at 50°C in stripping buffer (with slight agitation). Wash membrane six times for 5 min each in TBST. (Optional) To assure that the original signal is removed, wash membrane twice for 5 min each with 10 ml of TBST. Incubate membrane with LumiGLO® with gentle agitation for 1 min at room temperature. Drain membrane of excess developing solution. Do not let dry. Wrap in plastic wrap and expose to x-ray film. Wash membrane again four times for 5 min each in TBST. The membrane is now ready to reuse. Start detection at the "Membrane Blocking and Antibody Incubations" step in the Western Immunoblotting Protocol. Ethanol, anhydrous denatured, histological grade (100% and 95%). 1X Tris Buffered Saline with Tween® 20 (TBST): To prepare 1L 1X TBST add 100 ml 10X Tris Buffered Saline with Tween® 20 (#9997) to 900 ml dH20, mix. 1X Citrate Unmasking Solution: To prepare 250 mL of 1X citrate unmasking solution, dilute 25 ml of SignalStain® Citrate Unmasking Solution (10X) (#14746) with 225 mL of dH2O. 3% Hydrogen Peroxide: To prepare 100 ml, add 10 ml 30% H2O2 to 90 ml dH2O. Blocking Solution: TBST/5% Normal Goat Serum or 1X Animal-Free Blocking Solution. TBST/5% Normal Goat Serum: to 5 ml 1X TBST, add 250 µl Normal Goat Serum (#5425). 1X Animal-Free Blocking Solution: to 4 mL of dH2O add 1 ml of Animal-Free Blocking Solution (5X) (#15019). 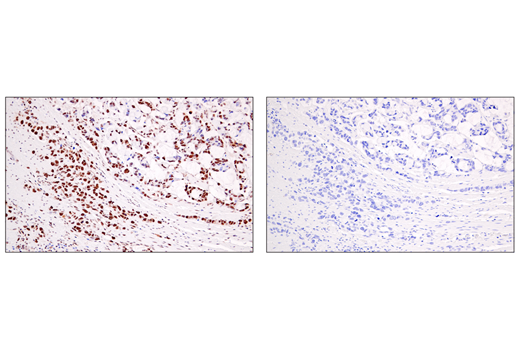 Detection System: SignalStain® Boost IHC Detection Reagents (HRP, Rabbit #8114). Substrate: SignalStain® DAB Substrate Kit (#8059). Mounting Medium: SignalStain® Mounting Medium (#14177). Incubate sections in three washes of xylene for 5 min each. Incubate sections in two washes of 100% ethanol for 10 min each. Incubate sections in two washes of 95% ethanol for 10 min each. Wash sections two times in dH2O for 5 min each. For Citrate: Heat slides in a microwave submersed in 1X citrate unmasking solution until boiling is initiated; follow with 10 min at a sub-boiling temperature (95°-98°C). Cool slides on bench top for 30 min. Wash sections in dH2O three times for 5 min each. Incubate sections in 3% hydrogen peroxide for 10 min. Wash sections in dH2O two times for 5 min each. Wash sections in wash buffer for 5 min. Block each section with 100–400 µl of preferred blocking solution for 1 hr at room temperature. Remove blocking solution and add 100–400 µl primary antibody diluted in SignalStain® Antibody Diluent (#8112) to each section. Incubate overnight at 4°C. Equilibrate SignalStain® Boost Detection Reagent (HRP, Rabbit #8114) to room temperature. Remove antibody solution and wash sections with wash buffer three times for 5 min each. Cover section with 1–3 drops SignalStain® Boost Detection Reagent (HRP, Rabbit #8114) as needed. Incubate in a humidified chamber for 30 min at room temperature. Wash sections three times with wash buffer for 5 min each. Add 1 drop (30 µl) SignalStain® DAB Chromogen Concentrate to 1 ml SignalStain® DAB Diluent and mix well before use. Apply 100–400 µl SignalStain® DAB to each section and monitor closely. 1–10 min generally provides an acceptable staining intensity. If desired, counterstain sections with hematoxylin (#14166). Incubate sections in 95% ethanol two times for 10 sec each. Repeat in 100% ethanol, incubating sections two times for 10 sec each. Repeat in xylene, incubating sections two times for 10 sec each. Mount sections with coverslips and mounting medium (#14177). Supplied in 10 mM sodium HEPES (pH 7.5), 150 mM NaCl, 100 µg/ml BSA, 50% glycerol and less than 0.02% sodium azide. Store at –20°C. Do not aliquot the antibody. DEK (E4S5J) Rabbit mAb recognizes endogenous levels of total DEK protein. Non-specific staining has been observed by IHC in nerve cells. Monoclonal antibody is produced by immunizing animals with a synthetic peptide corresponding to residues near the carboxy terminus of human DEK protein. The protein product of the DEK oncogene is a nuclear phosphoprotein that is highly conserved among higher eukaryotic organisms and preferentially expressed in actively proliferating and/or malignant cells (1,2). DEK is an abundant, non-histone chromosomal protein that establishes and maintains heterochromatin by interacting with HP1a, enhancing HP1a binding to tri-methyl histone H3 Lys9 and stabilizing local tri-methyl histone H3 Lys9 levels (3). DEK localized to euchromatin represses transcription by interacting with transcription factors such as RelA/p65 (4). The DEK protein also associates with mRNA processing factors to regulate splicing and nuclear export (5,6). The DEK proto-oncogene functions as a negative regulator of cellular differentiation, senescence, and apoptosis. DEK is translocated and/or over-expressed in a number of different cancers, including acute myeloid leukemia, breast cancer, cervical cancer, hepatocellular carcinoma, melanoma, and small cell lung cancer (1,2). In addition to the role of DEK in cancer biology, which is mainly related to its intracellular functions, extracellular DEK is implicated in the pathogenesis of autoimmune disorders (1,2). Circulating autoantibodies to DEK have been identified in the serum of patients with autoimmune diseases, including juvenile idiopathic arthritis, sarcoidosis, and systemic lupus erythematosus. DEK is secreted by human monocyte-derived macrophages and apoptotic T-lymphocytes and can act as a chemotactic, pro-inflammatory factor (7,8). Exogenous DEK can penetrate neighboring cells, and translocate to the nucleus to carry out its endogenous nuclear functions (9). IL-8 induced secretion of DEK from macrophages serves as a chemoattractant for peripheral blood leukocytes (7). Broxmeyer, H.E. et al. (2013) Stem Cells 31, 1447-53. Riveiro-Falkenbach, E. and Soengas, M.S. (2010) Clin Cancer Res 16, 2932-8. Kappes, F. et al. (2011) Genes Dev 25, 673-8. Sammons, M. et al. (2006) J Biol Chem 281, 26802-12. McGarvey, T. et al. (2000) J Cell Biol 150, 309-20. Soares, L.M. et al. (2006) Science 312, 1961-5. Mor-Vaknin, N. et al. (2006) Mol Cell Biol 26, 9484-96. Kappes, F. et al. (2008) Mol Cell Biol 28, 3245-57. Saha, A.K. et al. (2013) Proc Natl Acad Sci U S A 110, 6847-52. Cell Signaling Technology is a trademark of Cell Signaling Technology, Inc.
SignalStain is a trademark of Cell Signaling Technology, Inc.
XP is a registered trademark of Cell Signaling Technology, Inc.
Tween is a registered trademark of ICI Americas, Inc. Explore pathways related to this product. STRING - Known and Predicted Protein-Protein Interactions. Cell Signaling Technology Japan, K.K. Need information for a different country? Please click here. To get local purchase information on this product, click here. Find answers on our FAQs page. Changing to another country might result in loss of shopping cart.